present the topic given to you in multi-media form. This contest has been held for the past 15 years. talk to people in the know. – The contest is open to school children studying in classes 8 to 12.
to make this one presentation. 1. Ask your school teacher-adviser to seek the approval of your theme from the organisers. E-mail to – themadrasday@gmail.com – and get the okay from us BEFORE YOU START start work on the project. 2. We look for multi-media rich projects so make sure your project has all the features in it. 3. The PowerPoint presentation must have only key points and visuals. Not packed with info. (On each slide, you must have a maximum of just 3 lines, each line 5 words only). 4. At the contest venue, your team of 3 students will take turns at the mike to present the project using the PP. have to be done by all the three participants. It can be done in English or in Thamizh or a mix! 5. The duration of the complete presentation – PowerPoint and Oral – should not exceed 10 minutes. provide a PC and a projector at the venue to help you make your presentation. 7. Contest is open to first 20 teams to register on first-come-first-serve basis. certificates. The prizes will be given at about 3.30 pm. answers to the questions posed by the judges. 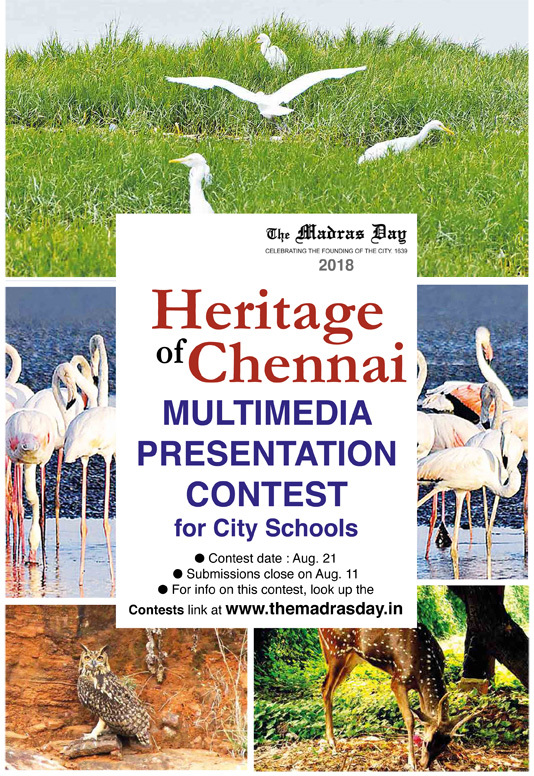 There are over 100 events held for Madras Day/ Madras Week in August.